My family immigrated to the United States through Ellis Island in 1950. Born of farmers, the principles of hard work and integrity were instilled at an early age. I graduated from CSU Fullerton School of Business. I maintain my IICRC Water Damage and Mold Remediation Certification, EPA RRP Certification and 40 Hour Supervisor Asbestos Certifications. 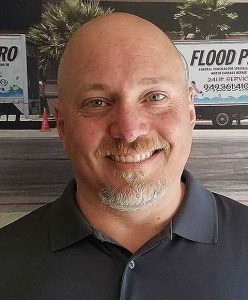 Prior to starting Flood Pro, I worked as a program manager in the Aerospace field and helped develop parts for Boeing, Raytheon, NASA’s JPL and Gulfstream Jets. This was a high-pressure industry where timelines and performance were held to very high standards while maintaining strict budgets. My wife and I started the company in 2007. We didn’t have the capital to compete in marketing efforts but we saw a hole in the service industry, a lack of customer service. In 2007 we created a customer-focused company where we had two goals. 1, to provide proactive customer service that would always be improving and 2) to create an environment where our employees were empowered, believed in our customer-focused culture and enjoyed coming to work. I’m married with 4 wonderful children and would rather be with them than anywhere else. I’m a dog lover and have 2 labs. I’m an Assistant Scout Master with Boy Scout Troop 639 in Foothill Ranch. I enjoy being outside and like skiing, motocross, mountain biking, camping, fishing, hiking, golf, baseball, and football.